In 1942, Jun Kaneko was born in Nagoya, Japan where he studied painting during his high school years. 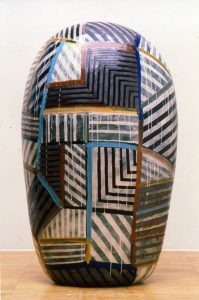 He came to the United States in 1963 to continue those studies at Chouinard Institute of Art when his focus was drawn to sculptural ceramics through his introduction to Fred Marer. He studied with Peter Voulkos, Paul Soldner, and Jerry Rothman in California during the time now defined as the contemporary ceramics movement. The following decade, Kaneko taught at some of the nation’s leading art schools including Scripps College, Cranbrook Academy of Art, and Rhode Island School of Design. Jun established his third studio in Omaha, Nebraska in 1990 where he primarily works. He has also created work in several experimental studios including European Ceramic Work Center, Otsuka Omi Ceramic Company, Fabric Workshop, Bullseye Glass, and A.S.A.P. He He created series of large-scale sculptures from 1982-1983 at his Omaha Project, from 1992-1994 at his Fremont Project in California, and currently at his Mission Clay Project in Kansas. His prolific roster of diverse work appears in numerous international solo and group exhibitions annually. His work is included in more than forty museum collections and his has realized over twenty-five public art commissions around the world. He has been honored with national, state, and organization fellowships and an honorary doctorate from the Royal College of Art in London.